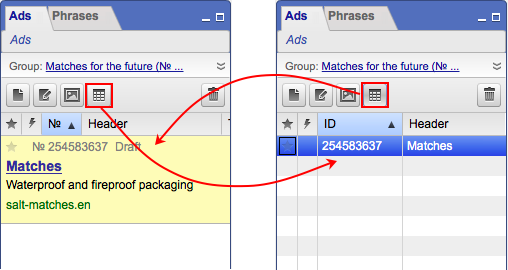 In the Ads tab, you can view ad sketches, while in the Ad groups you can view sketches that display one of the group's ads. Double clicking on the sketch switches the tab to table mode which allows ads to be edited. In addition, you can switch between modes by using the button. those belonging to stopped or still unlaunched campaigns and ads.